Counsel: Giam Chin Toon, SC (instructed), Daniel John, Kevin Lim and Ruth Zhu (Goodwins Law Corporation) for the appellant; Oliver Quek (Oliver Quek & Associates) for the respondents. 1 This was a small claims appeal against the decision of the referee (the “Referee”) of a Small Claims Tribunal (“SCT”). The grounds of decision of the Referee (“the GD”) are found in Tan Cheh Hiang @ Esther Tan Cheh Hiang & Others v Freely Pte Ltd in Claim No SCT/9162/2008 & Others. 2 The appellant, Freely Pte Ltd (“Freely”), the respondent in the SCT below, is a private limited company in the business of running a private school. The 48 respondents (the “Claimants”) were the claimants in the SCT below and are persons with diverse backgrounds which, inter alia, include working adults, professionals and retirees. The Claimants had all enrolled in a three-day options trading course (the “Course”) conducted by Dr Clemen Chiang (“Dr Chiang”), who was, at all material times, Freely’s director, shareholder and the conductor of the Course. Although there were initially 51 claims before the SCT, three claimants were absent from the proceedings below. The present proceedings before me involved an appeal against the decision of the Referee vis-à-vis 48 claims, ie, the claims of the Claimants who were present before the SCT. All 48 claims were filed in the SCT between 29 October 2008 and 3 November 2008[note: 1]. a web-seminar package (the “Webinar”, for which an amount of S$1,888 was paid[note: 4]). 28. —(1) A tribunal shall not be bound by the rules of evidence but may inform itself on any matter in such manner as it thinks fit. (2) Evidence tendered to a tribunal by or on behalf of a party to any proceedings need not be given on oath but the tribunal may, at any stage of the proceedings, require that such evidence or any part thereof be given on oath whether orally or in writing. (3) A tribunal may, on its own initiative, seek and receive such other evidence and make such other investigations and inquiries as it thinks fit. (4) All evidence and information received and ascertained by the tribunal under subsection (3) shall be disclosed to every party. (5) For the purposes of subsection (2), a Referee of a tribunal is empowered to administer an oath. (6) A Referee may require any written evidence given in the proceedings before a tribunal to be verified by statutory declaration. (b) notes of the proceedings. A tribunal shall determine the dispute according to the substantial merits and justice of the case and in doing so shall have regard to the law but shall not be bound to give effect to strict legal forms or technicalities. 6 To my mind, the above view (viz, that although an SCT is not bound to give effect to strict legal forms or technicalities, it must nonetheless determine disputes according to substantive legal principles) is implicitly buttressed by s 38(1)(a) of the SCTA which gives an aggrieved party, who has obtained from the District Court leave to appeal (see s 38(1B) of the SCTA), an opportunity to appeal against an order of the SCT “on any ground involving a question of law” . (i) Around 2-3 weeks before the hearing, I directed the SCT to record written statement of facts from the Claimants and the Respondent. This was a necessary departure from the usual SCT convention where parties orally relate their facts to the Referee at the hearing itself. If the convention was followed, the hearing would have taken an inordinately long time simply to elicit the parties’ respective version of events. (ii) The SCT first took statement from the Claimants. They recounted common facts as they were all course-mates present at the same talks given by Dr. Chiang. They also relied on the same Straits Times reports as evidence of their case. For this reason, I did not think it necessary to inconvenience the Respondent to tender 51 written statements in answer to each of the Claimant’s statement. Instead, I prepared a brief chronology of the Claimants’ facts (Summary of Claimants’ Statement of Facts) and directed the Respondent to submit their written response thereto (Respondent’s Statement of Facts). (b) On the day of the hearing, I started by explaining my role as a Referee, the procedures in conducting the hearing, and the reasons behind the use of the statements. I then secured the parties’ consent to proceed. (i) The first witness called was Esther Tan Cheh Hiang (the Claimant in SCT 9162/2008) who led evidence for the Claimants. Esther Tan was selected because she gave testimony in Mandarin. This enabled the Mandarin-only speaking Claimants to understand and follow the proceedings. Moreover, Esther Tan was also a party to all 3 Contracts [ie, the Course, the Software and the Webinar] with the Respondent. Hence her evidence would be relevant to all the issues covered in this case. (ii) To begin, I read to Esther Tan the Summary of the Claimants’ Statement of Facts and recorded her affirmation on the contents therein. Thereafter, I obtained confirmation from the rest of the Claimants that they similarly adopt the same chronology of facts appearing in the Summary of Claimants’ Statement of Facts. In the course of the hearing, I also allowed several other Claimants to testify on matters not mentioned in the said Summary. (iii) After the Claimants’ turn, I called Dr. Chiang to lead evidence for the Respondent. I read to him the Respondent’s Statement of Facts and likewise recorded his affirmation on its contents. (iv) In the course of the hearing, and in exercise of my inquisitorial fact finding role as a Referee, I also administered questions to the parties and recorded answers. 8 At this stage, it would be useful to reproduce the Summary of Claimants’ Statement of Facts and Freely’s Statement of Facts referred to above. (a)The 1st contract was an options trading course known as the “Live Freely Seminar”[ie, the Course] conducted by [Dr Chiang], a director of the Respondent… One group of Claimants attended the Course from 10-12 May 2008; and another group from 21-23 June 2008. (b)The 2nd contract involved the sale and purchase of an options trading software programme known as ‘Once In A Blue Moon’ [ie, the Software]. (c)The 3rd contract involved the sale and purchase of a series of online web-seminar courses known as “Kick Start and Protégé” [ie, the Webinar]. 2. The Claimants now claim from the Respondent a refund of monies paid [for the Course, the Software and/or the Webinar] respectively. All the Claimants rely on a common set of facts with immaterial variations in date and time (depending on whether they attended the Course in May 2008 or June 2008). (a) In 2004, he earned a Ph.D in Finance with his thesis titled “Options Trading as an Income Strategy for Financial Freedom: An Action Research Approach”. (b) His Ph.D was from a ‘prestigious university’. (c) As part of his Ph.D thesis, he developed the ‘FREELY Method’ (or Freely Dynamic Strategy) of options trading. (d) His FREELY Method of options trading was very easy to learn as one does not need any computer or stock trading background knowledge. (e) It was very easy to make money from trading options if one uses the FREELY method 20 minutes a day. (f) After the Course is completed, he will provide a 3-month follow up programme for the students. (g) He would be conducting the final class for 2008 for the Course before leaving for further studies. (h) He would grant a discount if the Preview participants signed up for the Course that evening. 5. In reliance of [Dr Chiang’s] representations, and in particular the fact that he has a Ph.D in Options Trading, the Claimants signed up for the Course. · behaved disrespectfully to the Claimants by calling them “idiots”. · sold the Webinar and Software to some of the Claimants at the end of a long and tiring 3 day course. · there will be Software updates provided. · there will be life-time support for the Claimants. · [Dr Chiang] continues to use this Ph.D as “it helps to pave the way in business”. · there were no Software updates provided to date. (c) In respect of the [Webinar], the Respondents stopped sending the Claimants materials and sessions on the [Webinar] after the Straits Times reports were published. · provided a course that was far inferior to other similar courses (e.g. conducted by T3B Holdings Pte Ltd). (a) He was in the process of rectifying the Software. (b) What he taught during the Course has no ‘link’ to his Ph.D.
(c) The matters concerning Preston University has no ‘link’ to him. (d) When he was taking the Ph.D, he did not know Preston University was not accredited. (e) He only knew that Preston University was not accredited when Straits Times published the article on 29 August 2008. 10 As summarised by the Referee, the Claimants had based their case on a statement published by Freely that Dr Chiang had a Doctor of Philosophy, ie, a Ph.D in options trading and had designed the Course around his Ph.D dissertation (the “representation”). On its part, Freely did not dispute making the representation as such. 1. I am Clemen Chiang Wen Yuan…. [and] I am the authorized representative of the Respondent in these proceedings. 2. 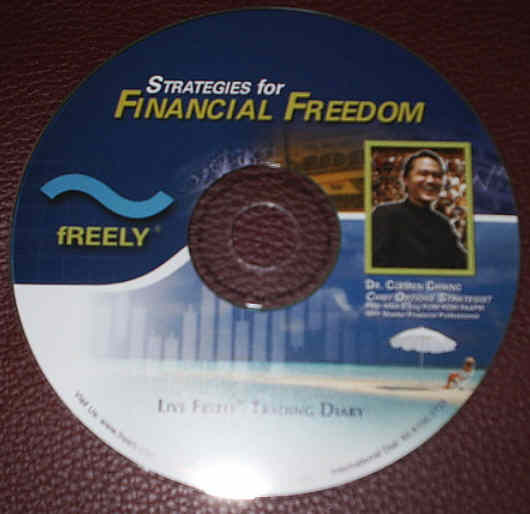 I am the Chief Executive Officer and Speaker of the FREELY METHOD options trading course in Freely Pte Ltd.
3. I have read the Summary of the Claimants’ Statement of Facts and wish to respond as follows. (i) The “Once In A Blue Moon” software is also known as “The Freely Method” in the contract. (b) I agree with paragraph 2 of [the] Statement of Facts. (c) I agree with paragraph 3 of [the] Statement of Facts. (v) A variable discount off the seminar price is given. (i) The students signed up for the options trading course based on their interest in the knowledge and not because of my PHD. (iv) I did not get angry with students, nor behave disrespectfully to them by calling them “idiots”. With respect to my conduct to the students, the students have given positive feedback such that I scored an average of 4.7 out of 5 in the feedback forms from all the claimants. They gave encouraging comments like “You are the best speaker I have seen” and “Your seminar was very motivating and informative”. (v) There is also a money back guarantee (clause 20 of the Freely contract) and a refund can be given by 6 p.m. of day one of the seminar. There have been genuine cases of students who were refunded the full amount at the end of day one. (v) I sold the products during lunchtime or dinnertime of the third day, hence they could only purchase the [S[oftware within the 60-minute period while the administrative staff was still present. (i) I did not say that [the] claimants could not carry out options trading successfully without the software, only that it would take lots of time to analyze the method. The oftware will reduce the time to 20 minutes, as it was aggregated data from many websites to make it convenient for students to analyze the [S[oftware. (i) I agree with paragraph 6(d) of [the] Statement of Facts. (ii) The Google group is a privilege, from a student-teacher relationship and not [a] contractual guarantee stated in the contract. (i) The matter is between the U.S. Universities and the relevant authorities. I have produced the announcement from Preston University in response to the allegations regarding Preston University in [the] Straits Times. (ii) The online portal contained accurate and up-to-date information. (iv) There have been regular software updates. (i) This “Kick Start and Protégé” web-seminar course is conducted via a “Web Ex platform”, which allows the students to view the video at home. Due to copyright issues, the viewing sessions are limited to three views. (vii) Freely School does not provide a course that was far inferior to similar courses and this opinion is also in direct contradiction to the feedback forms. One of the claimants stated, “You are the best speaker I have seen”. (ii) The Preston University saga affected everyone, including hundred of Preston University graduates in Singapore like myself. (j) Individual contracts, mug shots, graduation photographs and feedback forms from each claimant. (c) Freely to pay each Claimant disbursements fixed at S$10. (f) damages for the Software contract should be nominal. 14 After hearing the parties’ oral submissions and considering their written submissions, I dismissed Freely’s appeal. While I agreed with the final decision of the Referee, I would like to make some observations on certain aspects of this case to provide some guidance. The Minister for Labour and Second Minister for Law and Home Affairs (Prof. S. Jayakumar): Mr Deputy Speaker, Sir, on behalf of the Minister for Law, I beg to move, "That the Bill be now read a Second time." The primary purpose of this Bill is to provide for a speedy and inexpensive machinery to handle small claims arising from disputes between consumers and suppliers. The Bill seeks to do this by authorizing the setting up of one or more Small Claims Tribunals to deal with the settlement and adjudication of these claims. The Small Claims Tribunal will be constituted as part of the Subordinate Courts but will not be bound by strict rules of evidence or by normal court procedures. To ensure that costs are kept to a minimum and that a litigant will not be at a disadvantage because he is unable to afford legal representation, the Bill provides that the parties to the proceedings must present their own case and excludes representation by an advocate and solicitor. Although this Bill is being introduced by the Ministry of Law, it has its origin in the Ministry of Trade and Industry, whose objective for the Bill is to create a new institution to help consumers to protect themselves. Before touching on specific aspects of the Bill, I would like to briefly restate Government's basic thinking on consumer protection. The Government believes that the consumers are best protected through free trade and competition in a free market. Competition not only ensures that prices are the lowest possible but also ensures good quality and service. However, this does not mean that the consumer can make his purchases blindly. In order to get the most out of the free market, the consumer has to be vigilant and must shop around to compare prices, quality and services. He must also be aware of his rights as a party to a contract. The second course is for consumers to seek their redress and remedies in the courts. However, proceedings in the courts are often expensive, time-consuming and subject to technical and procedural complexities. The recovery of small claims, that is claims below $2,000, may therefore be hardly worth the effort. Cost is involved and is prohibitive and may well exceed the amount which the successful litigant could recover. …The informality of the tribunal and its simplified procedure should enable any layman to present his own case. This Bill represents an important milestone in the field of consumer protection, and I hope that Members will whole-heartedly support it. 16 As is clear from the foregoing excerpt, the SCTA was to provide a simple, informal and inexpensive way for a complaint involving a small claim to be heard (see also D’Souza’s Article at p 269). 17 I now come to the CPFTA. 18 Given that all 48 of the present claims were filed in the SCT between 29 October 2008 and 3 November 2008, references to the CPFTA are to the 2004 Revised Edition of this statute and not to the 2009 Revised Edition (ie, Consumer Protection (Fair Trading) Act (Cap 52A, 2009 Rev Ed) which incorporated amendments to the CPFTA (see Consumer Protection (Fair Trading) (Amendment) Act 2008 (No 15 of 2008)) which only took effect from 15 April 2009 (ie, after the claims in the present instance were filed). 20 I should stress however, that although the drafting of the CPFTA appears to have been inspired by equivalent legislation in various jurisdictions, it would be inappropriate to import, carte blanche, all principles applicable to the interpretation of the equivalent legislation in other jurisdictions, unless these principles accord with the wording of our CPFTA and Parliament’s intention in enacting the CPFTA in Singapore, the latter of which I will now come to. The Minister of State for Trade and Industry (Mr Raymond Lim Siang Keat): Mr Speaker, Sir, I beg to move, "That the Bill be now read a Second time." Sir, for some years now, the Consumers Association of Singapore (CASE), as well as several Members of this House, have advocated the enactment of a fair trading law. This is because while some particularly offensive practices like cheating or intimidation are prohibited under our criminal laws, many errant sales tactics, such as bait advertising, misrepresentation, and hard selling, are not clearly covered by any of our existing laws. In 2001, a joint private and public taskforce, co-led by CASE and MTI, was formed to study this issue. In 2002, the Government accepted the recommendation of the taskforce to enact a Fair Trading Act. The Bill now before the House is principally designed to accord better protection to consumers by allowing them to seek civil redress against traders engaging in unfair practices. The primary focus is on small consumers who lack the expertise and resources to fend for themselves against unfair practices. Clause 4 of the Bill defines what constitutes an unfair practice, and 20 such examples are listed in the Second Schedule. The trader must not mislead the consumer. He should provide the consumer with all relevant and material information in order that the consumer can make an informed decision. Clause 6 of the Bill allows consumers aggrieved by unfair practices to obtain civil remedies from the trader before the court. They can do so within one year of the discovery of the unfair practice. As the Act is intended primarily to protect small consumers, the claim amount will be capped at $20,000. We expect most claims to be filed in the Small Claims Tribunal. In determining whether or not the trader has engaged in an unfair practice, the court will consider the reasonableness of the trader's actions in the circumstances surrounding the unfair practice. The court shall also have regard to whether or not the consumer made a reasonable effort to resolve the dispute with the trader, and to minimise any loss or damage resulting from the unfair practice. These provisions are in clauses 5 and 7 of the Bill. Sir, in drafting this Bill, we are mindful of the need to balance the interests of the consumers and traders. On the one hand, the Act must provide adequate safeguards for consumers and allow them legal recourse to claim against unfair practices. On the other hand, we do not want to over-regulate and add to business costs. Amongst traders, those who engage in unfair practices are a minority. It will be unfair to impose undue regulatory costs on the majority who conduct business ethically. This would also be bad for consumers, for such costs will in the end be passed back to them. We have also chosen not to criminalise unfair practices. This is because the more serious offences are already covered by existing legislation. There are no criminal sanctions in our proposed legislation. Instead the Bill will hold traders accountable for unfair practices by making them liable for civil restitution. This will empower consumers to seek civil remedies against errant traders, without having to rely on or wait for the Government to take action. Besides allowing for quick redress, this approach of self reliance will encourage greater consumer responsibility and pro-activity. The Minister of State for Trade and Industry (Mr Raymond Lim Siang Keat): Mr Speaker, Sir, I am very pleased that this particular Bill has generated such interest among Members. I think it bodes well for the Bill, as a key thrust of the Bill is to raise awareness of the issues involved in consumer protection. I have listened very carefully to all the suggestions. In particular, I would like to thank Members for the support that they have given to the Bill. But let me just put things in perspective to begin with. What is the underlying philosophy when we drafted this Bill? Basically two. One is that the principle of caveat emptor remains. That is the operating paradigm. What does it mean when we say "buyers beware"? It means that, as a society, we believe that the individual should take responsibility for his or her own action when he or she enters into a transaction. Two, we must all be aware that it is not just one interest here, but two interests to balance off. On the one hand, yes, we would like to give adequate protection for the small consumer not to be taken advantage of and enter into an unfair transaction. On the other hand, it is businesses and traders. There should be business certainty and not undue costs in complying with this proposed Act. So, let us bear that in mind, because this informs the Act and the drafting of the Act. … So, the context is quite different. What we have done here - and as Mr Yeo Guat Kwang said in his speech - is really to enable the consumer to seek civil redress, if there has been an unfair practice. Criminal offences are already in the books for the more serious offences, such as cheating, touting, false labelling. So, the Bill is really quite similar to the other consumer protection legislations that we have in Singapore today such as the Misrepresentation Act, Unfair Contract Terms Act, Hire Purchase Act. In none of these consumer protection Acts have we created a body to police these Acts. And the fact that there has been no agency created for these has not affected the effectiveness of the Act. The intent and purpose of the Act have been fulfilled. (d) without limiting the generality of paragraphs (a), (b) and (c), to do anything specified in the Second Schedule. 6.—(1) A consumer who has entered a consumer transaction involving an unfair practice may commence an action in a court of competent jurisdiction against the supplier. (c) any regulations made under section 11 insofar as the action relates to a relevant contract. The above provision in the CPFTA referring to the SCTA is significant because the SCTA itself does not expressly refer to the CPFTA. 25 Having touched upon the legislative framework surrounding the respective enactments of the SCTA and the CPFTA, this would be a convenient juncture to refer to the relevant limitation period as this point was raised by Freely. (b) after the expiration of one year from the date on which the cause of action accrued. 28 The Referee applied s 12(1)(b)(i) to the Claimants’ claims. He was of the view that the date of accrual of their cause of action for the purpose of the SCTA was the date they had knowledge that Freely’s representation was misleading. This was the date of publication of the article in the Straits Times of 29 August 2008. 29 While I accept that s 5(3) SCTA should logically incorporate the knowledge provision of s 12(1)(b) CPFTA, it does not. In other words, the terms of s 5(3) SCTA do not explicitly state that the date of the cause of action is the date the consumer had knowledge that the supplier had engaged in the unfair practice in question. 30 Accordingly, it is arguable that the Referee was not correct when he effectively applied s 12(1)(b) CPFTA to s 5(3) SCTA. However, although counsel for Freely invited me to make a ruling on the point as it was likely to be relevant for the other pending claims, I declined to do so for the time being. Counsel for the Claimants had declined to present any argument on the point since it was irrelevant to the Claimants he represented as they did not face an issue of limitation unlike the other claimants. the tribunal may order that such claims be heard at the same time. (2) The power conferred by this secton may be exercised by a tribunal notwithstanding that he hearing of one or more the claims has begun. for all 51 (which, as mentioned above, was the original number of claims supposed to be heard) claims to be heard together in a single sitting because “it would have been highly impractical and uneconomical for the SCT to host 51 separate hearings especially since the claims involve common question of law and fact” (see  of the GD). The Referee had also likened the present proceedings to a “class action” (see  of the GD). it seems that an SCT may hear a class action. 34 However, Parliament may wish to review whether the machinery of an SCT is indeed intended, and well equipped, to deal with class actions especially where they involve allegations of misrepresentation. Such actions may become more prevalent in the future. As already mentioned, there are more than 400 claims pending against Freely before an SCT. Parliament may also want to consider whether the machinery of an SCT should apply to class actions where the total quantum of claims exceeds the monetary limit of any one of such claims. 35 I now move on to examine what constitutes an “unfair practice” under the CPFTA. 36 The material provision which underpinned the Referee’s decision vis-à-vis the Course was s 4(a) of the CPFTA (see  above). Section 52 of the Australian Trade Practices Act provides that: “A corporation shall not, in trade or commerce, engage in conduct that is misleading or deceptive or is likely to mislead or deceive”. In this regard, several Australian cases [per Gibbs C.H. in Parkdale v PUXU (1982) 42 ALR 1 at 6 and per Northrop J. in Annand & Thompson v TPC (1979) 25 ALR 91 at 111. See also the New Zealand Case of Marcol Manufacturers Ltd v Commerce Commission  2 NZLR 502] have held that whether the conduct has been misleading or deceptive has to be tested against the standard of a reasonable man even though the term “reasonable” does not appear in the Australian statute. A fortiori, since the Singapore statute specifically refers to reasonableness, clearly the test is objective. There is nothing in the section that would confine it to conduct which was engaged in as a result of a failure to take reasonable care. A corporation which has acted honestly and reasonably may therefore nonetheless be rendered liable…The liability imposed by s 52 . . . is thus quite unrelated to fault. Whether or not s 52(1) is contravened does not depend upon the corporation’s intention or its belief concerning the accuracy of such statement, but upon whether the statement in fact contains or conveys a meaning which is false, that is to say whether the statement contains or conveys a misrepresentation. This also appears to be the position in Canada [referring to Findlay v Couldwell and Beywood Motors (1976) 5 W.W.R. 340 at 345 and Mikulus v Milo European Cars Specialists Ltd (1993) CPR (3d) 1 at 10] and New Zealand [referring to Marcol Manufacturers Ltd v Commerce Commission  2 NZLR 502 at 508]. Thus, it is likely that Singapore courts would also adopt this stand in relation to conduct which is misleading. In fact this position in Canada, Australia and New Zealand, is not only in respect of civil liability but also criminal liability. In Singapore there is only civil liability and no direct criminal liability for the breach of any of the provisions of the CPFTA. Thus a fortiori, the lack or presence of intention should be irrelevant. This view is further fortified by the fact that in Singapore, some of the specific provisions under Second Schedule [such as clauses 4, 5, 13, 17 and 18] require… knowledge or intention in order to give rise to liability. This suggests that where there is no express reference to knowledge or intention in the section or where the words themselves do not by implication raise the need for intention or knowledge, which is clearly the case with section 4(a) in so far as it deals with misleading conduct, knowledge or intention should be irrelevant. “misleading” and “deceptive”, are plainly not synonymous . . . . “Mislead” does not necessarily involve an element of intent and it is a word of wider reach than “deceive”. However, it is difficult, in my opinion, to read the word “deceive” in s 52 other than as involving some degree of moral turpitude as it does in ordinary English usage. Trickery, craft and guile . . . are typically at the heart of this second element of the statutory provision directed to the protection of the public from unfair trading practices.
. . . a deceptive act does not necessarily involve deliberate intention to deceive. Deception need only have the capability of deceiving or misleading and it may be inadvertent yet still sufficient to void the transaction under the statute, which is directed to the welfare of the consumer, not the punishment of the vendor. Of the two views, it is suggested that the position in Canada is to be preferred. The emphasis in section 4(a), too, seems to be on the effect on a reasonable consumer rather than on the intent of the supplier. However, even if the Australian view as stated above is adopted, it may not really make much of a practical difference. This is so because even if deception cannot be established because of a lack of intention, the conduct is likely to be misleading nonetheless and hence the supplier may still be liable. (b) any conduct having the capability, tendency or effect of deceiving or misleading a person. [A] deceptive act does not necessarily involve deliberate intention to deceive. Deception need only have the capability of deceiving or misleading and it may be inadvertent yet still sufficient to void the transaction under the statute, which is directed to the welfare of the consumer, not the punishment of the vendor. Similarly, in Mikulas v. Milo European Cars Specialists Ltd.[(1993), 52 CPR (3d) 1 at 10, aff’d (1995), 60 CPR (3d) 457 (BCCA)], the British Columbia Supreme Court said that a car dealer would have been liable under the Act for making false statements about a car sold to the plaintiff even if he had honestly believed the representations he made. The implication of the statutory qualification found in s.7(5) [of the SCPA] is unclear. While it appears that a supplier is exonerated of responsibility for deceptive or misleading conduct if he or she acted reasonably, the Act offers no guidance [as in the CPFTA] as to what is or is not reasonable, nor how reasonableness relates to state of mind. Is a supplier who honestly believes a misrepresentation about her product to be true, but could by making inquiries have determined its falsity, liable under s.5(a)? Is a supplier whose conduct is consistent with ordinary business practices excused, even though that conduct might reasonably mislead a consumer? Has a supplier committed an unfair practice if she believes that a particular consumer is not being misled, though the conduct in question has the capacity to mislead a reasonable consumer? The unique problems presented by this provision require careful consideration on the part of those charged with its interpretation and application. Although s.7(5) offers some comfort to suppliers faced with the challenges of the new legislation, the ambiguity it creates exacerbates the already difficult task of determining whether a particular incident or course of conduct does or does not constitute an unfair practice. [3.9] The [Trade Practices Act]…[is] silent as to whether a person must have intended to mislead or deceive in order to contravene s 52…but, in view of the question’s importance, it arose in the very early misleading conduct case law. In its first major analysis of s 52, the High Court [of Australia in Hornsby Building Information Centre Pty Ltd v Sydney Building Information Centre Ltd (1978) 140 CLR 216 at 228; 18 ALR 639 at 647 per Stephen J (Jacobs J agreeing), CLR 234; ALR 651 per Murphy J] rejected the argument that an intention to mislead is a necessary element of conduct having the proscribed character. In the words of Stephen J, the prohibition is concerned with consequences as giving to particular conduct a particular colour” and hence in claims based on s 52, ‘nothing turns…upon the intent’ of the defendant. Like the tort of passing off, it was said, s 52 is designed to ensure that ‘trading must not only be honest but must not even unintentionally be unfair’. The absence of an intention requirement does, however, give s 52 a significantly wider ambit than other analogous general law causes of action. Fraud, for example, requires proof of a misrepresentation made with knowledge of, or recklessness as to, its falsity, and proof of malice is also required to establish injurious falsehood at general law. [3.10] While the general principle that intent need not be proved in order to establish a contravention of s 52 has received subsequent High Court endorsement [in Parkdale Custom Built Furniture Pty Ltd v Puxu Pty Ltd (1982) 149 CLR 191 at 197, 198; 42 ALR 1 at 5, 6 per Gibbs J, CLR 216; ALR 20 per Brennan J; Yorke v Lucas (1985) 158 CLR 661 at 666, 61 ALR 307 at 309 per Mason ACJ, Wilson, Deane and Dawson JJ, CLR 765 675; ALR 316 per Brennan J], it has also become apparent that the defendant’s knowledge or belief will not always be irrelevant in the breach inquiry. In Global Sportsman Pty Ltd v Mirror Newspapers Pty Ltd, the Full Federal Court noted that the essential characteristic of misleading or deceptive conduct is that it ‘contains or conveys a meaning which is false’ and that where the impugned conduct consists of a ‘statement of past or present fact’, the speaker’s ‘state of mind is immaterial’ to whether the conduct embodied such a meaning. Nevertheless, the court commented, ‘[m]any statements, for example, promises, predictions and opinions, do involve the state of mind of the maker of the statement at the time [it] was made’. A decision as to whether such conduct conveyed a false meaning will therefore necessarily involve consideration of whether ‘the maker of the statement had a particular state of mind when the statement was made’. [3.11] The relevance of intention in such cases has been widely acknowledged. In Bridge Stockbrokers Ltd v Bridges [(1984) 4 FCR 460 at 474; 57 ALR 401 at 415 (Full Fed Ct)], though, Lockhart J suggested that some further ‘refinement’ may be necessary, concerning ‘the intent of the alleged offender…in determining whether conduct is misleading or deceptive’. While acknowledging that intent was ‘not an essential element in the notion of misleading or deceptive conduct’, his Honour expressed the view that ‘deceptive’ in s 52 could bear the meaning of ‘cheating, ensnaring or deliberately misleading’ and envisaged circumstances ‘where there will be deceptive conduct only where the intention of the [defendant] is established’. Lockhart J gave the example of conduct which is intentionally designed to create mere confusion in order to avoid contravening the prohibition. The ramifications of these dicta have not been explored in subsequent case law, however, suggesting that the circumstances in which such dishonesty may convert what would otherwise not be misleading conduct into a breach of s 52 will be unusual. [3.12] Although a misleading or deceptive conduct plaintiff will usually not be required to prove intention or dishonesty on the part of the person who engaged in the impugned activity, a separate question arises as to the significance of a finding to that effect. Indeed, it is in relation to the latter issue that Lockhart J’s comments in [Bridge Stockbrokers Ltd v Bridges [(1984) 4 FCR 460 at 474; 57 ALR 401 at 415 (Full Fed Ct)] regarding intention appear to have provoked a response in the form of subsequent acceptance that proof of intention to mislead may have probative value in establishing that the prohibition has been breached. The high point to date of that recognition was the Full Federal Court’s decision in Telmak Teleproducts (Aust) Pty Ltd v Coles Myer Ltd [(1989) 89 ALR 48], in which it was accepted that proof of an intention to deceive, whilst not of itself establishing that conduct was misleading or deceptive, was ‘of powerful evidentiary value’ in the finely balanced factual matrix of the case, tipping the scales in favour of a holding that s 52 had been breached. To date, however, the persuasive worth of such proof has been explored principally in relation to [Australian Trade Practices Act] claims resembling passing off actions at common law, and accordingly the matter will be explored further in that context below. [3.13] It was previously noted that s 52…differ from fraudulent misrepresentation in relation to the need to prove intention. The prohibition can also be distinguished from another general law analogue, that of negligent misrepresentation, in so far as the fault of the defendant is concerned. While liability under the general law action is founded upon the defendant’s negligence, questions as to the level of care taken by the defendant to avoid causing the proscribed effect have generally been ignored in the determination of whether s 52 has been contravened. In [Parkdale v PUXU (1982) 42 ALR 1], for example, Gibbs CJ, in a comment that has never been doubted, noted that there was ‘nothing in which would confine it to conduct which was engaged in as a result of a failure to take reasonable care. Further, neither knowledge of the misleading character of the conduct nor a lack of good faith are necessary for the prohibition to be breached. [3.14] In contrast to the developments regarding intention which were discussed in the preceding paragraphs, the courts have rarely acknowledged that proof of a lack of care by the person who allegedly engaged in misleading conduct can have evidentiary significance in the determination of whether the prohibition has been contravened. The proposition that ‘carelessness on the part of the respondent is not a necessary element of a s 52’ claim [as stated in Neilsen v Hempston Holdings Pty Ltd (1986) 65 ALR 302 at 309 per Pincus J (Fed Ct)] seems to have been so dominant that there have been only occasional hints that proof of carelessness may be of assistance in establishing a breach of the prohibition. In Rhone-Poulenc Agrochimie SA v UIM Chemical Services Pty Ltd [(1986) 12 FCR 477 at 487; 68 ALR 82 at 82 (Full Fed Ct)], for instance, Bowen CJ noted that a defendant’s awareness of the risk associated with its product was a relevant but not decisive consideration as to whether a failure to disclose was conduct of the proscribed character. In view of the paucity of reference to the issue in the case law to date, however, the role that evidence of carelessness might play in a court’s decision as to whether conduct is misleading or deceptive, or likely to have that effect, remains to be explored. “unfair or deceptive acts or practices in or affecting commerce…” and, “unfair methods of competition”. -the standard of “misleading” or “deceptive” conduct recognises that the audience on the receiving end of conduct directed at the public will include the less astute and the gullible and the inexperienced and poorly educated. Section 9 is the central provision of the Fair Trading Act. There has been a marked reluctance in Australia to read down the words of the equivalent section (s.52 of the Trade Practices Act 1974 (Aust)). What is misleading or deceptive is a matter of fact to be resolved in the circumstances and context of each case. The trend in Australia is that the prohibition is being applied in an ever widening range of circumstances. It has generally superseded the torts of deceit and passing off and is being used more frequently in contractual misrepresentation situations. (a) Conduct cannot, for the purposes of sec 52, be categorized as misleading or deceptive, or likely to be misleading or deceptive, unless it contains or conveys a misrepresentation: Taco Company of Australia Inc v. Taco Bell Pty Limited  ATPR 40-303 at p 43, 751 (1982) 42 ALR 177 at p 202. (b) A statement which is literally true may nevertheless be misleading or deceptive: see Hornsby Building Information Centre Pty Limited v. Sydney Building Information Centre Pty Limited  ATPR 40-067 at p 17, 690; (1978) CLR 216 at p. 227. This will occur, for example, where the statement also conveys a second meaning which is untrue: World Series Cricket Pty Limited v. Parish  ATPR 40-040 at p 17, 436 (1977) 16 ALR 181 at p 201. (d) The question whether conduct is, or is likely to be, misleading or deceptive is an objective one, to be determined by the Court itself, in relation to one or more identified sections of the public, the Court considering all who fall within an identified section, of the public including the astute and the gullible, the intelligent and the not so intelligent, the well educated as well as the poorly educated, men and women of various ages pursuing a variety of vocations: Taco Company at ATPR p 43, 752, ALR, p 202. Evidence of the formation in fact of an erroneous conclusion is admissble but not conclusive; Global Sportsman at ATPR p 45, 343, ALR p 30. (b) it would appear, from a plain reading of s 4(a) of the CPFTA which makes no express reference to knowledge or intention, that an intention or knowledge to mislead or deceive (ie, a fault element) is not a necessary ingredient. The emphasis in s 4(a) of the CPFTA is on the effect on a reasonable consumer rather than on the state of mind or knowledge of the supplier. In this case, the absence of a state of mind requirement gives s 4(a) of the CPFTA a wider ambit than other analogous common law causes of action, viz, fraudulent and negligent misrepresentation, which are founded on the fault of the defendant. That said, while the supplier’s state of mind is not an essential element in the notion of misleading or deceptive conduct, a decision as to whether the supplier’s conduct conveyed a misleading or deceitful meaning may involve consideration of whether the maker of the statement had a particular state of mind when the statement was made (ie, it is probative in establishing whether s 4(a) of the CPFTA has been breached). (c) That the emphasis in s 4(a) of the CPFTA is on the effect on a reasonable consumer is consistent with Parliament’s underlying philosophy behind the enactment of the CPFTA (see  above), viz, that there should be a balancing of the interests of consumers against that of businesses and traders. If the emphasis in s 4(a) of the CPFTA was on the effect on any consumer, not only would this be inimical to the principle of caveat emptor emphasised by Parliament, this would also be contrary to its intention in ensuring that “[t]here should be business certainty and not undue costs in complying with [the CPFTA]”. (d) Pursuant to s 5(3)(a) of the CPFTA, it would appear that a supplier who has engaged in an unfair practice may be excused by acting reasonably although the CPFTA offers no guidance as to what is or is not reasonable. 11 Against these assumptions, it is my finding that a reasonable consumer would read the representation to mean “Buy our options trading goods and services because Dr. Chiang is an academic expert in options trading;” One would therefore think that Dr. Chiang is an academic expert by reason of him possessing a credible PhD from a credible university. Conversely without a credible PhD, Dr. Chiang cannot claim to be an academic expert. Hence, the credibility of his PhD comes into issue. I stand as Respondent and teacher. My credentials is the key issue. I believe that I went through the PhD programme. I never withheld the fact that my PhD is from Preston. 47 The Referee found (at [12a] of the GD) that a reasonable consumer with the belief that Dr Chiang is an academic expert on options trading would be materially influenced by the representation. He also found (at  of the GD) that the representation was misleading. He concluded there was unfair practice on the part of Freely (see  of the GD) and, in doing so, he said he considered (at  of the GD) whether Freely’s actions were reasonable in the circumstances but did not think that they were. 48 Yet, Freely submitted that the Referee had erred in law. Freely’s ground was that the test was the reasonableness of its action. While Freely elaborated as to why its conduct was reasonable, this was a question of fact and the Referee did have valid reasons for his conclusion. Therefore, I rejected this ground of appeal. 49 Freely also alleged various breaches of natural justice by the Referee. 50 First, Freely alleged that it had very little time to respond to the claims. On the other hand, the Claimants pointed to a schedule of Freely’s attendances to dispute this. Dr Chiang had attended on three dates of consultation for the claims, ie, 10, 11 and 13 November 2008. Subsequently, a Notice of Hearing dated 26 February 2009 was issued. The Notice stated the hearing to be on 12 March 2009. It was clear to me that given that Dr Chiang had already attended consultation sessions since early November 2008, he had enough time to respond to the claims by 12 March 2009. Moreover, it was undisputed that Freely did not ask for the hearing date to be postponed. The first allegation was without merit. 28. —(3) A tribunal may, on its own initiative, seek and receive such other evidence and make such other investigations and inquiries as it thinks fit. 52 As can be seen, s 28(4) was not applicable because it refers to s 28(3) which in turn refers to evidence which an SCT receives from its own initiative. 53 As for the making of a summary, I was of the view that the Referee was entitled to have one prepared and forwarded to the other side under the informal and expeditious process envisaged under the SCTA so long as the summary was an accurate one and Freely knew what it had to respond to. There was no suggestion that it was either an inaccurate summary or a vague one. 55 There was no verbatim record of the proceedings before the SCTA. However, even if the alleged remarks had been made and had been made sarcastically, which was not necessarily the case, I was of the view that they did not demonstrate bias or gave an impression of bias, even though they would have been inappropriate. 56 The next allegation about bias was that the Referee appeared to have made up his mind even before the hearing was concluded as he had a prepared text of his decision thereafter which took him about two hours to read (with translation into Mandarin). Yet, Freely’s counsel accepted that it was not uncommon for a tribunal to prepare a draft text of the decision and amend it, if needs be, as a hearing progresses in the interest of efficiency. That would explain how a tribunal is able to come up with a prepared text soon after a hearing. However, he submitted that this point should not be seen in isolation and, considered together with the other allegations about breaches of natural justice, it demonstrated bias on the part of the Referee. I did not agree. 57 Having considered all the allegations of such breaches, I was of the view that they were not made out and that there was no bias, apparent or otherwise. (e) make an order varying the contract between the supplier and the consumer. 60 However, while a tribunal may order a party to the proceedings to pay money (which, as the Referee recognised at  of the GD, can represent damages, debt or even restitution of sums paid in part or in full) to another party, the more interesting question, in the context of damages, is what exactly is the measure of these damages? Should a tortious or contractual measure of loss or damages be adopted? Also, must the unfair practice be the sole cause of the loss or damage suffered and must there be reliance on the unfair practice? … Likewise it has been held that, similar to the position in common law, the fact that the misleading or deceptive statement was only one of the reasons for entering into the contract, and not the sole reason, does not absolve the supplier of liability. These stands too are likely to be adopted in Singapore. Further, in relation to relief [pursuant to s 7(4)(b) of the CPFTA,] in determining the amount of damages, it is not clear whether the tort or contract measure of damages would apply in determining such losses. The tort measure of damages would aim to place the plaintiff in a position that he would have been had the tort not been committed [referring to Livingstone v Rawyards Coal Co (1880) App Cas 25). The contract measure of damages would aim to put the plaintiff in a position he would have been had the contract been properly performed [referring to Robinson v Harman (1848) 1 Ex 850]. The fact that many of the provisions of the CPFTA deal with false representations may suggest that the tort measure should apply. On the other hand, parts 11, 12 and 20 of the Second Schedule which do not deal with misrepresentations may suggest that the contract measure should apply. However, parts 11, 12 and 20 do not deal with breach of contract as such. Rather they relate to “unfair practices” and hence the tortious measure may be more appropriate. In addition, Australian [referring to Gates v City Mutual Life Assurance Society Ltd (1986) 63 ALR 600 and Neilsen v Hempston Holdings Pty Ltd (1986) 65 ALR 302) and New Zealand cases [referring to Cox & Coxon Ltd v Leipst  2 NZLR 15 and Harvey Corporation Ltd v Barker  2 NZLR 213] have held that the correct measure to be adopted is generally the tort measure. [w]hile it is clear that [unfair practice] does not have to be the sole cause [of the loss or damage suffered by the consumer], it is not clear whether it has to be a substantial cause. Lockhart J. in Henjo Investments Pty. Ltd. v. Collins Marrickville Pty. Ltd. (1989) 79 ALR 83 at 96 (citing Wilson J. in Gould v. Vaggelas [(1985) 157 CLR 215] seems to suggest this need not be so, but see Elna Australia Pty. Ltd. v International Computers Pty. Ltd. [(1987) 75 ALR 271] [which] seems to suggest otherwise. [10.3] … For the purpose of discussing causation in misleading or deceptive conduct law, it is sufficient to consider briefly the manner in which [the matter has been] approached in analogous common law causes of action, particular deceit and negligent misstatement. Where a number of acts or events have contributed to the loss claimed, the defendant’s fraud or negligence need not be the sole cause of the loss claimed in order for it to be identified as a ‘legal cause from the mass of necessary conditions’. Instead, the relevant question is whether the defendant’s act was a cause of the plaintiff’s loss. Hence, although a plaintiff in deceit or negligent misstatement must prove that ‘he was induced [by the misrepresentation]…to alter his position in a manner affecting his material, temporal or physical interests’ to establish causation, proof that the fraud or negligence was the only reason for that alteration of position is not necessary for that purpose. [10.8] As Burchett J has noted, ‘the language of s 52 [of the Australian Trade Practices Act] evokes the question: misled or deceived into what?’ The section proscribes conduct having a particular effect upon the mind of its victim, which does not in itself constitute loss or damage. Rather, damage will be suffered by action or inaction under the influence of the error induced by the breach. Hence, in Wardley Australia Ltd v WA [(1992) 175 CLR 514], Mason CJ, Dawson, Gaudron and McHugh JJ commented that where misleading conduct consists of a misrepresentation, ‘as at common law, acts done by the representee in reliance on the misrepresentation constitute a sufficient connexion to satisfy the concept of causation’ for s 82 [of the Australian Trade Practices Act] purposes. Clearly, then, establishing reliance is a means of proof of causation in the [Australian Trade Practices Act] setting. Nevertheless, some doubt remains as to whether reliance must be proved to establish causation under the [Australian Trade Practices Act]. There are no reported misleading conduct decisions in which causation has been established without proof of reliance, but there seems to be no objection in principle to the proposition that reliance, although ‘plainly sufficient to support the necessary causal connexion between conduct and loss…is not…a necessary element’ of causation under the [Australian Trade Practices Act]. The issue awaits further consideration by the courts in novel fact settings. It is also noteworthy that immediately after the statement quoted above from Wardley, their Honours remarked that if acts of reliance ‘result in economic loss…that economic loss will ordinarily be recoverable under s 82(1) [of the Australian Trade Practices Act]’, which suggests that proof of reliance alone will not establish causation in that setting. The court must also be satisfied that the loss or damage claimed resulted from the acts done in reliance on the conduct. [10.10] While a breach of s 52 [of the Australian Trade Practices Act]…may induce a ‘wide variety of actions’, the most commonly alleged act of reliance in the misleading conduct case law to date is entry into a contract which would not otherwise have been made. 65 Subsequent cases suggest that reliance is a pre-requisite to a claim for damages under Australian legislation. 66 In Ford Motor Company of Australia Ltd v Arrowcrest Group Pty Ltd  134 FCR 522, Lander J (delivering the judgment of the Federal Court of Australia) rejected, at  of the plaintiff’s submission that causation can be established in a misrepresentation case without proof that the misrepresentations were relied upon. He stated, at -, that Wardley Australia Ltd v Western Australia (1992) 175 CLR 514 (“Wardley Australia”) is not authority for the proposition that a plaintiff does not need to establish reliance in a claim for damages and that the High Court in Wardley Australia confirmed that causation in cases where the plaintiff had entered into a transaction because of the defendant’s misrepresentations would be established by proof of reliance. 68 I come now to the position under the New Zealand Fair Trading Act 1986. As already noted above at , Hill and Jones states that “it is unnecessary that any person be actually misled or deceived”. 69 However, the position in New Zealand may not be as clear as suggested above. There must be a causal link between the conduct and the loss. Where the conduct alleged is a misleading representation or misleading or deceptive conduct, the need for a causal link would obviously be satisfied if a person to whom the representation was made relied upon it and suffered loss in consequence. The Judge found that this was not alleged in the present case. With respect, however, it does not follow that the representation could not, as such, have caused the loss. 71 In Reference No MVD 31/07  NZMVDT 40 (19 March 2007), the Motor Vehicles Dispute Tribunal was concerned with a claim by a car purchaser who alleged that the seller had misrepresented the mileage of the car she purchased. The tribunal referred to, inter alia, Bennett and held at  that as the purchaser did not rely on the seller’s misleading conduct, there was no damage flowing from it. it was reasonable for the plaintiff to have been misled. (a) The Respondent says that the Claimants signed up for the Course based on their interest in the subject and not because of the PhD. As the law stands, this is not a defence. In any event, I have already decided that the Claimants were in fact influenced by the representation to enter into the Contracts. 74 The situations under which a claim may be made under the SCTA are diverse. Nevertheless, I was of the view that, generally speaking, it is not sufficient to show that a reasonable consumer would have relied on the representation. A claimant must also show that he did rely on the representation. For example, he cannot claim relief under s 6 CPFTA if he was not even aware of the representation or thought nothing of it. Otherwise the balance would tilt too much in favour of consumers. Accordingly, I am of the view that the Referee erred when he said that it was not a defence to say that the Claimants did not sign up for the Course because of the Ph.D. Nevertheless, this was not a ground of appeal, presumably because he nevertheless concluded that the Claimants were in fact influenced by the representation. 75 I pause here to caution that this is one aspect of a class action that requires attention. An SCT should be careful and consider whether each and every claimant relied on a representation. While this may make an SCT hearing more tedious, it is a route that must be travelled. This may well be part of the reasons why an SCT is not suited to hear a class action, especially of one involving allegations of misrepresentation, but I need not say more for now. 76 While Freely did not raise the absence of reliance as a ground of appeal, one of its other grounds was that the Referee was incorrect in concluding that there was no price benefit to the Claimants in purchasing the Software. Freely submitted that the correct test was whether the Software was worth more than the price at which it was sold, ie, $960 and not whether the software was worth the $16,000 that Dr Chiang had mentioned the usual price of the Software to be. I did not agree with Freely. Dr Chiang had suggested that the usual price for the Software was $16,000. This was shown to be untrue. This was an unfair practice (see also para 7 of the Second Schedule of the CPFTA). 77 I now move on to examine the appropriate measure of damages to be awarded where there is an unfair practice and reliance. 78 Chandran suggests, pointing to Australian and New Zealand decisions in support, that the correct measure to be adopted is the tortious measure of damages. That this is the appropriate measure of damages under the CPFTA was also accepted by the Referee (see [8(f)-(g)] of the GD). The tortious measure of loss is normal under s 82 [of the Australian Trade Practices Act] (see Gates v City Mutual Life Assurance Society (1986) 160 CLR 1; see also Zoneff v Elcom Credit Union Ltd (1990) ATPR 41-009; on appeal, (1990) ATPR 41-058) but it is not appropriate in every case: see Elna Australia Pty Ltd v International Computers (Australia) Pty Ltd (1987) ATPR 40-795 at 48, 678-9; Munchies Management Pty Ltd v Belperio (1989) ATPR 40-926; and Western Australia v Wardley (Australia) Ltd (1992) 175 CLR 514 at 526, The tortious measure of damage attempts to place the plaintiff in the position the plaintiff the plaintiff would have enjoyed if the tort had not been committed. In Gates v City Mutual Life Assurance Society the High Court held (at 12) that the question to be asked in Pt V cases is “how much worse off the plaintiff is as a result of entering into the transaction which the representation induced him to enter than he would have been if the transaction had not taken place”. According to the Gates test a plaintiff can recover reliance loss but not expectation loss, Under the tort measure a plaintiff is also entitled to any consequential losses directly flowing from reliance on the conduct in contravention of the Act. The onus is on the plaintiff to demonstrate that, but for the conduct in contravention of the Act, the plaintiff would have taken another course of action and is thus entitled to consequential damages. The immediate and direct consequential losses caused by the respondent’s conduct will depend upon evidence of causation. 81 For the same reasons offered by Chandran and Lockhart, I accepted that the appropriate measure of damages under the CPFTA for loss or damage which arises from unfair practice is, generally, the tortious measure of damages, viz, the difference between the value of what has been purchased and what was paid. (a) In the circumstances, the correct measure of damages in respect of the Course Contract would be the price paid less the price of an equivalent options trading course conducted by a credible institution (without the hypnotheraphy and motivational components). (b) Under section 28(3) and (4) [SCTA], a tribunal may, on its own initiative, seek and receive such other evidence and make sure other investigations and inquiries as it thinks fit provided all such evidence and information received is disclosed to every party. I have therefore investigated what credible options trading courses are available in the market. The most reasonable of which is a seminar conducted by the local Nanyang Technological University (NTU). Incidentally, Dr. Chiang mentioned that this course is conduced by 2 of his ex-students who do not possess PhDs in options trading. This therefore gives me some indication as to how much a pared-down version of the Respondent’s curriculum is worth in the market. (c) The NTU course is priced at $590 for the public for 2 full days (or $295 per day). I have adopted this public rate rather than the subsidised rate enjoyed by NTU members. I would also give the Respondent an extra day’s credit in recognition of their higher overhead costs in comparison to NTU. Using this guide, I hereby award damages to the Claimants at a sum equal to price paid less ($295 x 3 days at $885). This computation I think best serves the interests of justice in a Small Claims proceedings where the tribunal is not bound by strict rules of evidence and can inform itself on any matter in such manner as it thinks fit: section 28(1) [SCTA]. 83 As may be seen, the method of calculation of damages adopted by the Referee, viz, price actually paid for the Course less the actual value of the Course accords with the tortious measure of damages. 21. The unfair practice in respect of the PhD also provides a good ground for the claims on the Software and Webinar Contracts. Additionally, I detected the presence of another unfair practice. (a) [Freely] claimed that the Software had an original value of $16,000 but was on offer for $960. Under s 4(d) [of the CPFTA] read with paragraph 7 of the 2nd Schedule, the representation that a price benefit exists where it actually does not, constitutes an unfair practice. I asked [Freely]to explain why he [ie, Dr Chiang] claimed the Software was worth $16,000. His answers were vague and indeterminate, leading me to conclude that the purported value of $16,000 was fictitious. (b) He claimed to have offered the Software for sale at $16,000 to financial institutions but have never sold one at that price. (c) To justify the value at $16,000, he included the value of past video recordings of his Webinars at $1500 to $2000 but admitted that the [respondents] would not be able to view those past recordings even though they purchased the Software. (d) He even ascribed a value of US$1,500 to the very instructions on how to use the Software. (d) In respect of these contracts, the products are still substantially intact. These are essentially licenses given to the [Respondents] to use software or web platforms. All expenses incurred by the Respondent in producing the Software and Webinar are essentially overhead costs incurred prior to the sale of those products. In other words, those expenses were business costs that the Respondent would have…expended regardless whether they sold any Software or Webinar. Although there is a CD given for the Software Contract and hardcopies of course materials furnished, I do not see any bars to a full refund. (c) the password was only given to the students on 17 May 2008[note: 9]. These factors, in addition to the Claimants’ evidence (see [7(b)] of the Summary of Claimants’ Statement of Facts at  above) that all or most information contained in the Software was freely available on the Internet as they were links to online websites (which was not disputed by Freely), all mean that the actual value of the Software, which some of the respondents had purchased for S$960, was negligible. In accordance with the tortious measure of damages, this effectively translates to a full refund of the price actually paid for the Software. 87 With regard to the Webinar, the evidence on record was that it was only for three views[note: 10]. It was also undisputed by Freely that after the Straits Times report was published, Freely stopped sending the Claimants (who had purchased the Webinar) materials and sessions on the Webinar (see [7(c)] of the Summary of Claimants’ Statement of Facts at  above). In these circumstances, as with the Software, the actual value of the Webinar was negligible. In accordance with the tortious measure of damages, this effectively translates to a full refund of the price actually paid for the Webinar. 88 On the issue of damages in respect of the Course, Freely submitted that the Referee had adduced evidence of his own investigation of a 2-day course on options trading without giving Freely an opportunity to address such evidence, contrary to s 28(4) SCTA which I have set out above (see ). However, the notes of evidence showed that the Referee did raise such evidence with Dr Chiang. Furthermore, it was for Dr Chiang to adduce his own evidence on the issue of the quantum of damages, without prejudice to Freely’s denial of liability, but he did not do so. 89 As for damages for the Software, Freely submitted that there should only be minimal damages but did not show how the Referee had erred in law in his decision to order a full refund. There was also inadequate elaboration as to why the damages should be nominal. I rejected this ground of appeal as well. 90 For all the foregoing reasons, I saw no reason to disturb the Referee’s decision against Freely. Clemen Chiang, the founder of Freely Pte Ltd was sued by 48 people in the Small Claims Tribunal & ordered to refund close to 80 per cent of their fees for the seminar and a full refund for the cost of the software and 'webinars'. The latest news today has Clemen Chiang's appeal was dismissed by the High Court. Thanks to a Straits Times expose on degree mills last August in which the report named ('Dr', yeah right) Clemen Chiang as having a PhD from an unaccredited university, these 48 people realized that they had made a wrong decision. One was quoted to comment: "I signed up because of his PhD. Option trading is a complicated thing. I thought this guy should know what he is talking about since he had a PhD in it". Well, you know what they say about this: "Those who can, do. Those who can't, teach". And to make it more relevant in this shameful case of Clemen Chiang's Freely refund, "Those who can't teach yet want to teach, sue them!". My sincere hope that Clemen Chiang--irregardless of his questionable PhD degree--may indeed a sort of 'expert' in options trading. His option is running low & he has now close to $180K to pay back to the 48 people he almost conned. Then again if he's really such an expert, he won't have wasted his time trying to educate people in options trading, would he? The logical thing is that Clemen Chiang would just continue enriching himself with his 'expertise' in options trading. The conclusion is left without saying. People who read his ad, should have felt alarmed. Oh well, maybe his 'PhD' degree indeed was quite convincing. A company belonging to a self-styled expert on option trading lost an appeal yesterday against claims awarded by the Small Claims Tribunal to 48 people amounting to $176,583. They had filed the claims after The Straits Times reported that Freely Pte Ltd's founder, Mr Clemen Chiang, allegedly obtained his doctorate in option trading from an unaccredited university. The 48 people claimed they would not have attended Mr Chiang's three-day course on option trading or bought a $960 computer program if he was not the holder of a PhD from an accredited university. In yesterday's appeal in the High Court, Freely alleged that the company was not given a fair hearing by the Tribunal hearing in March. The Tribunal is part of the Subordinate Courts and a Referee - who can be a Magistrate, a District Judge or a Senior Officer - can hear claims involving the sale of goods or services not exceeding $10,000. "The Referee appeared to have made up his mind even before the hearing was concluded, as his immediate oral decision, which he read from a prepared text, took about two hours to be read out, with translation into Mandarin," said Freely's lawyer, Senior Counsel Giam Chin Toon. But Justice Woo Bih Li, who heard yesterday's appeal, countered that it was common for judges to write their judgments and make the necessary changes, even as the hearing is ongoing. After a day's hearing, the High Court judge dismissed Freely's appeal without citing his grounds of decision. The Tribunal has more than 400 claims against Freely still to be heard. From Today, "Freely loses appeal against claims payout". A GROUP of 49 people scored a legal victory over a self-styled expert on option trading who turned out to have a dodgy doctorate from an unaccredited American university. A dozen of the course participants said they had paid Mr Clemen Chiang between $3,600 and $4,000 last year for a three-day course on option trading - a complex and risky investing technique which often amounts to betting on share-price trends. Several had also forked out another $960 for training software and a handful paid $1,600 to $12,000 more for online tutorials referred to as 'webinars'. Mr Chiang, a 34-year-old Nanyang Technological University engineering graduate, has been running these seminars for a few years at his Freely Business School in North Bridge Road. He would tell students his own success story of how he made millions, and he drew hundreds of participants. He claimed to have a PhD in option trading, a rarity in the finance industry here. But when it came to light last year that his doctorate was from the unaccredited Preston University in Alabama, the group of 49 wanted their money back. Yesterday, the Small Claims Tribunal found that Mr Chiang had misrepresented his qualifications. It awarded all participants a refund of close to 80 per cent of their fees for the seminar and a full refund for the cost of the software and 'webinars'. Mr Chiang, who still calls himself 'Dr', attended the hearing but did not speak to The Straits Times. The Small Claims Tribunal is part of the Subordinate Courts and can hear claims involving the sale of goods or services not exceeding $10,000. Outside the tribunal, several participants said they felt cheated when they read a Straits Times expose on degree mills last August. The report named Mr Chiang as having a PhD from an unaccredited university. Sales representative Terence Tan, 41, said: 'I signed up because of his PhD. Option trading is a complicated thing. I thought this guy should know what he is talking about since he had a PhD in it. Like some others, he felt the course fell short of providing a good understanding of option trading. Engineer William Hui, who paid $8,000 for himself and his wife to attend Mr Chiang's course, said: 'He should have called it 'Millionaire mindset', because for a whole day, it was just about how much money he made, his Sentosa Cove bungalow and his wife's Hermes Birkin handbag costing over $10,000. Mr Chiang still claims to have a PhD on several of his websites, but makes no mention of Preston University, which American education authorities have called a 'degree supplier' offering 'fraudulent or substandard degrees'. Last August, he told The Straits Times that he was also pursuing another PhD at the University of South Australia. When asked then why he had opted for a degree from an unaccredited institution, he said he wanted to complete a PhD in double-quick time. Because Preston University was listed as a partner of a private school registered with the Education Ministry here, he said he thought it was an accredited institution. It was only later that he realised that Preston was not accredited in the United States, he said. Like other business people who had bought fake degrees, Mr Chiang said then that it helped to pave the way in business. Checks last year found more than 200 people - including prominent businessmen and financial consultants - flaunting degrees, MBAs and doctorates from degree mills and unaccredited, substandard institutions.